New Non-Metallic Concrete Box Offers More! The heavy-duty FLBC4502 4.5" non-metallic concrete floor box has more features – SIX conduit hubs, FOUR plugs – And THREE options for positioning the low voltage divider in the box. Add the NEW FLBC4502LR leveling ring for even easier installation of any 6 inch cover on ANY 4.5" concrete box including our FLBC4500 and the new FLBC4502. It’s REVERSIBLE! Side A fits any 6" round cover with a 3-1/2" screw hole pattern. Side B has a second set of holes for 6" covers with a 3-3/8" screw hole pattern. Arlington offers a variety of cover kits to fit our concrete boxes – Round with flip lids or threaded plugs in brass or nickel-plated brass. Metal trapdoor covers with three device options. And in plastic, in six colors. Get a great-looking, time-saving receptacle installation in new concrete with floor box kits, covers and more - from Arlington! With Arlington's Listed, economical gangable concrete floor box kits you build the box you need - onsite. Single gang, non-metallic boxes lock together to create a two- or three-gang box that accommodates a PLASTIC cover (5 colors) or diecast zinc cover with brass or nickel finish. Plus, covers install with the hinge on either side. Get an easy, flush receptacle installation with Arlington's FLB6230MBLR Cover Kit. It fits Arlington's FLBC4500 and FLBC4502 boxes – and most other manufacturers' 4-1/2" concrete boxes. 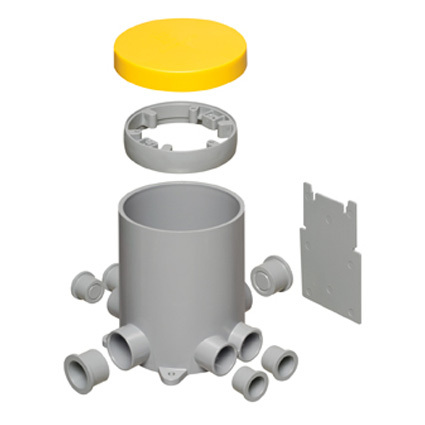 This cover kit has flip lids and includes the 6" brass cover, gaskets, receptacle AND a leveling ring. Arlington's steel Countertop Box Kits offer multiple options for installing a Listed receptacle in a countertop up to 1-1/2 inches thick. These steel boxes come with stainless steel or black trapdoor covers. Install them by simply tightening two screws to hold the spring steel clip secure against the underside of the countertop.